What adoptees need to know is that their experience was real. Adoption isn’t a concept to be learned, a theory to be understood, or an idea to be developed. It is a real life experience about which adoptees have had and are continuing to have constant and conflicting feelings, all of which are legitimate. The greatest value in the book for me as an adoptee was Verrier’s ability to matter-of-factly name and articulate so many of the conflicting and chaotic emotions and thoughts that swirl around in my mind, and have since I was a child. 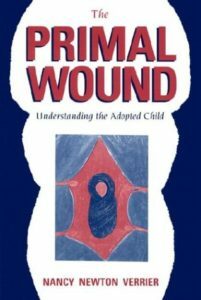 While I didn’t identify with every issue resulting from the “primal wound”, I would say I did identify with about 65% of what the author discusses. (For reference, I’m thirty-five years old and have great relationships with my adoptive family and even some biological siblings.) Naming and defining helps a person know that they aren’t alone, and that things or normal. In other words, the book has given me permission to be honest with myself about my feelings towards both of my families (biological and adopted). This book isn’t perfect, primarily because it was originally written in 1993. I would like to see Verrier update the book to include a more contemporary view of the social and legal landscape surrounding adoption, as well as the academic and professional literature. It’s hard to trust ideas that old relative to what you would otherwise trust in psychology or health. A quick observation about some of the negative reviews of this book you’ll find on Amazon or Goodreads: Most of the negative comments I’ve seen regarding this book aren’t from adoptees. They come from adopted parents uncomfortable with Verrier’s message and what they call “adoption negative” tone. I didn’t read the book that way at all. I found it affirming. As sad as it sounds, I needed to hear someone say that I’m worthy of existing. As mentioned above, I would respectfully caution these adoptee parents. With all of that in mind, I would recommend this book to anyone in the adoption triad. Adoptive parents need to consider their motives for adoption and how to best love their kids. If the things in the book make you uncomfortable, think about what your child may be hiding from you. Adoptees will benefit from the book whether they agree with it or not, just by considering their lives and story from another angle. Have you read Nicole Chung’s book on her adoption as well? How would you compare her first person experience with this book? I wasn’t aware of it until you mentioned it here – thanks! Have you read it, yet? I was just thinking about how the time period in which this was written would have such a major impact. I do think the societal shifts around towards adoption – in both attitudes and the attention paid – have been major, and would be interested in an updated version of the book. I’m glad that you found some recognition in it, though: It matters so much to see your own experiences echoed somewhere.